Mathematics is a religion whose followers falsely believe in one absolute nothing: the difference between two things that are the same. This belief, which underpins the construction of equations (1 = 1, ∴ 1 – 1 = 0), causes inequality. This inequality manifests itself in trade imbalances between individuals and between sovereign states, economic exploitation, nationalism, the rise of authoritarian regimes, poor collective decision making and inadequate stewardship of the planet. It leads to trade wars, violent conflicts and environmental degradation. Whoever controls the use of nothing (zero) controls everything, whether they are fit to do so or not. To avoid privileging some over others, new mathematics is required: mathematics that is rooted not in the disembodied abstract ideas of a priesthood, but in the properties of real physical things. These mathematics treat two interacting numbers like two people (two self-referential beings) in a relationship. Each identifies themselves exclusively with themselves, so ↑ turns ↑ into ↑ and ↓ turns ↓ into ↓. One side is coded in XOR and the other in XNOR. 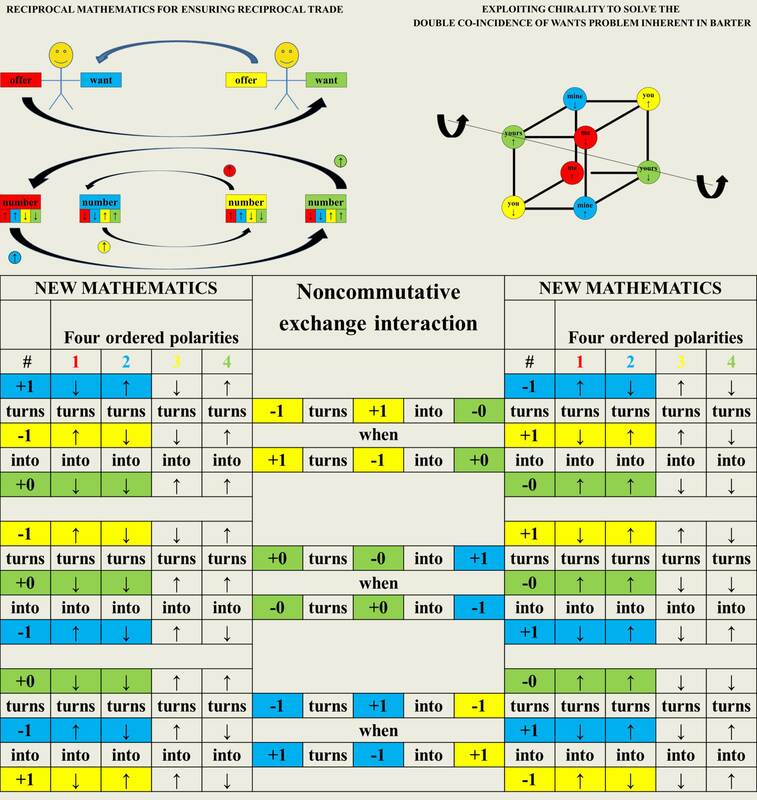 The result is non-commutative mathematics which treats the two sides of a relationship symmetrically and can be implemented physically by rotations. Using these mathematics, Chinese exporters, the US banks and the US government could no longer exploit the willingness of US consumers to buy imported goods on credit, because the mathematics would not allow the US consumers to buy from China unless Chinese consumers buy from US. The problems of today have been caused not by bad people, but by reliance on mathematics that is inherently biased.